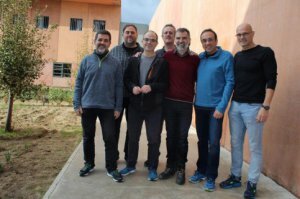 The Spanish Government has turned down a petition from jailed Catalan pro-independence politicians currently on trial and running in Spain’s forthcoming general election, from holding any campaign rallies at the prison where they are held. The Esquerra Republicana (ERC) party requested permission to hold rallies in Soto del Real, the penitentiary centre in Madrid where its top candidate and former Catalan vice president Oriol Junqueras is jailed whilst on trial. Accused of rebellion for calling a referendum and declaring independence in 2017, and with prosecutors demanding a 25-year prison sentence, Junqueras is one of the 12 Catalan leaders currently facing trial in Spain’s Supreme Court. The Spanish home affairs ministry dismissed his petition invoking security reasons, the need to preserve coexistence among inmates, as well as to avoid interfering with the ongoing trial, and to preserve the neutrality of public institutions. The Supreme Court has already rejected a request from Junqueras and five other pro-independence politicians to leave prison in order to take part in the campaigns for the Spanish general election on 28 April, and the local and European elections on 26 May. The court denies that standing for election while in jail undermines their political rights, and argues that keeping the politicians in custody ‘ensures’ that they are at the disposal of the court for as long as their trial lasts. Spain’s electoral authority has also rejected the petition of another candidate, Jordi Sànchez, to hold debates in prison with the frontrunners of other parties during the campaign. The reason given is the request’s ‘lack of precision’. Likewise, the same body turned down the pro-independence Esquerra party’s request to prevent the far-right Vox party from acting as a private prosecutor in the Catalan trial during the campaign. According to Esquerra, the proceedings give ‘more visibility’ to Vox than electoral law allows to all parties.